Fast-forward to the 1:05 mark to watch a great moment in local news. Galley Friend B.W. sends us this story about a pair of LA realtors suing CSI for defamation. I don't know much about defamation law (specifically, how it's different from libel law), but I wonder if realtors who advertise extensively, using images of themselves, count as public figures. The Harriet Miers nomination was one of the few bright moments for conservatives during the Bush administration. Nearly every conservative intellectual outside the precincts of Townhall.com stood up to oppose Miers--not because she wasn't conservative enough or reliable enough--but because she was, by any reasonable standard, neither smart enough nor accomplished enough for the job. Her nomination was the worst of mix of identity politics and cronyism. And for the first time since 9/11, conservatives were willing say, Hold on--I didn't sign up for this. Clearly, the left has not gotten to that point with Obama. Because if they had, they'd be jumping off the Sotomayor bus rapido. The problem with Sotomayor isn't her politics. She's a lefty. So is Obama. He won and the Dems control the Senate, so that's their prerogative. The problem is that she's a grievance warrior with ideas about race and racialism that are supposed to be out of bounds. Absolutely nobody is making the argument that she's the most intellectually qualified person in America for the gig. And there seems to be at least some evidence that her temperament leaves something to be desired. President Obama can appoint--and probably get confirmed--anybody he wants. So why not pick a devastatingly smart lefty? Was Elena Kagan busy? Was Cass Sunstein out of town? Shouldn't the left demand as much from Obama? After all, nearly anyone can give you the vote you want. It takes a good deal more to advance or defend an agenda. If I was a liberal Obama supporter, I'd be pretty despondent right about now. But all the evidence suggests that the left is in for a penny, in for a pound. Obama keeps disappointing them--wiretapping; no Iraq withdrawal; an escalation in Afghanistan; support for torture; no movement on gay issues; little transparency--and they keep rolling right along with him. Of course, on the one hand, you dance with the one that brought you. On the other, take a look at the GOP to see what loyalty in the face of mistakes gets you at the end of the day. If you'll recall, liberals were thrilled with the idea of Harriet Miers being on the Supreme Court. They were prepared to pound the table and vote against her, but they thought she was the best they (if not the country or the law) could hope for. Conservatives are now in a similar position. PS: The Gormogons note that in his introduction to Sotomajor, President Obama said that SCOTUS judges have to interpret principles first more on paper "20 centuries ago." It sure is great to have a con-law scholar as president. Update: Hugh Hewitt--pro-Miers and pro-Sotomayor! Paint the map red! Isn't that viewpoint normally beyond the pale? (So to speak.) Or is it only career-destroying when Steve Sailer brings it up? Update: For all her bravery in bringing racialism, it's pretty easy to "terrify" Sotomayor. Also, I understand that the position of Supreme Court Justice is slightly higher on the prestige meter than Attorney General of the United States, but to argue that "to Hispanics, the nomination would be an absolutely historic landmark" seems to completely forget AG A.G., no? Or maybe the real lesson is: Only Democrats get credit for diversity hires. If the Denver Nuggets meet the Orlando Magic in the Finals this year, would you give up all conspiracy-theorizing about the NBA? I might. Can you name five less gracious journalists than Mike Kinsley? Journalism being what it is, this should be easy, but I can only think of two or three off the top of my head. Oh, in case you don't have time to click through the link, Kinsley wants you to know how much he hates his former boss at Time--and how stupid the guy is! Which is weird, right, because Kinsley was such a class-act when he took job. So you better get out of the way! Who will be the first to read the new V as a critique of Obama-ism? I don't know. But it would make a fantastic bookend to any LoTR-as-defense-of-Bush exercise . . . Most people seem surprised by Kris Allen's win over Adam Lambert last night on the Idol finale. I'd argue that the result wasn't as unexpected as you might think. My household voted for Kris (almost entirely on the strength of his cover of "Heartless," which was the best performance of the season), but I submit that Adam was, at nearly ever turn, the superior candidate. His final night performance was better, his body of work over the course of the season was better, and he's a more saleable commodity as a recording artist in the future. By nearly every metric, he should have won. Except that there were some indications that Adam had somewhat polarized the voters. Late in the show he finished in the bottom three. And when the show went down to three contestants two weeks ago, it was Adam and two other, virtually indistinguishable, guys. At that moment, it appeared most clearly that there might be a substantial "Not Adam" vote that had been split in the later stages of the competition, but was slowly congealing. From there, it hardly mattered whether it Kris or Danny in the final. One of them would get the other one's vote as the "Not Adam" vote finally consolidated. So why not Adam? Drudge was teasing this as a Red State-Blue State showdown, but I think that's not quite right. Adam is personally pretty appealing, but his two wheelhouses--glam rock and showtunes--are violently at odds with the musical norms of the series. And worse, when he let them mix, became something weirdly unsettling: American culture has, thankfully, closed the book on the rock opera. Ultimately, I think that's what did Adam in. Mind you, I suspect he'll ultimately have the more productive career. But these things are hard to project. I don't know that you could have predicted that Carrie Underwood would have, by far, the best post-Idol career. Or that Jennifer Hudson would win an Oscar. And anyway, I still find David Cook the most interesting performer to come out of the show. It would be nice to see him break big. "[I]t is Tarantino's most sophisticated film since part one of Kill Bill." Since Kill Bill Part 1, Tarantino has directed one and a half movies. Can't tell if it this is Wild, Wild West or The League of Extraordinary Gentlemen. Or worse. I'd love to hear the rationalizations for this. The video is pretty amazing. But the real scandal seems to be that the Birmingham police department had the video, and knew about the officers' actions, for months. And did nothing about it. It wasn't until someone in the DA's office saw it and took made a beef that the officers were fired. There's a trailer out for DC's new animated feature, Superman/Batman: Public Enemies. It doesn't look like anything particularly special. Which is a shame, because the original book, by Jeph Loeb and Ed McGuinness, contains what I take to be the single best distillation of the DC universe's bedrock characters. And it's all done in a spare, two-page prologue. The prologue begins with a young Clark Kent playing baseball in a field in Smallville. Clark hits a ball way out over a fence by the road. He goes to retrieve it and sees a fancy car parked on the side of the road with a flat tire. A tall, thin gentleman--Alfred Pennyworth, as it turns out--is changing the flat. And sitting sullenly in the back of the car is young Bruce Wayne. Bruce and Clark eye one another for a moment before going their separate ways. Clark head back to baseball; Bruce turns back to his plotting. In thought bubbles, Clark says, "I still wonder if we should've asked him to play. If it would've made a difference." And Bruce's thought in reply is, "Sometimes, I wish they had asked me to play. But, by then, my life had changed. I had no time for games." This is a masterpiece in 8 panels--8 panels!--and it lays out everything you ever need know about Superman and Batman. From here, it's a straight line to Book IV of Dark Knight Returns. It's comics writing at its very, very best, though I'm not sure it'll translate particularly well to film, even animation. The side question in all of this is why DC has committed itself to direct-to-video animation for its properties. I realize they've had mostly bad experiences with live action, but this strikes me as a failure of management, not material. There's no foundational reason why DC can't build its own film universe the way Marvel has. And I suspect there's more than enough room at the multiplex for both. I've been getting stoked for surf season the last few weeks, thinking about the 4' monsters I'm gonna shred down at the encee. Looking at videos like this is only filling me with more stoke. It doesn't look so big until the helicopter starts pulling back. At which point you might be thinking, "No . . . oh no . . . dear God, no . . ."
Watch it all the way to the end, because a couple times you think he's dead and somehow he outraces the thing. Unbelievable. We weren't the only ones obsessing over Malcolm Gladwell's understanding of the full-court press. More criticism at NY Mag and Deadspin. The writer who sings the praises of The Wages of Wins has traveled a vast distance from the writer who once declared that "Iverson is worth a dozen Larry Browns" and who took it for granted that "to be a great athlete, you have to care." It's a writer who seems to be doing quite a bit of thinking without thinking." This is even more horrifying than the Obama stuff. So a guy who has a prestigious New York Times gig hasn't made a payment on his house in eight months. And the bank hasn't bothered to foreclose on him. And he's sold the story of how he fucked up his financial life as a book. That's not journalism. It's grifting. Where was this story during the TARP debate? A friend sent me a 63-page "scriptment" for James Cameron's forthcoming Avatar. I'd heard about the project beforehand but had no idea what the story was actually about. Turns out, it's Last of the Mohicans meets Apocalypto meets the Battle of Endor, meets an Earth Liberation Front Recruiting video. With dashes of Jurassic Park and The Matrix thrown in for spice. Crazy, crazy stuff. "I was pretty messed up in the head. I’m always messed up in the head, but I was even more messed up in the head." It Depends on the Definition of the Word "Definition"
I was excited when my local AMC recently put up signs announcing that they had installed an IMAX screen. The only other IMAX screens in the area are down on the Mall and out by Dulles Airport; neither which is a fun trip. Having an IMAX 3 miles away in a place designed for easy access sound almost too good to be true. I haven't gotten over there to see a movie on the new screen, but it turns out it probably is too good to be true. This development (putting the IMAX stamp on large screens that are not actually IMAX format) is particularly disappointing coming from AMC, which is otherwise a great company. And all I got was this lousy t-shirt. 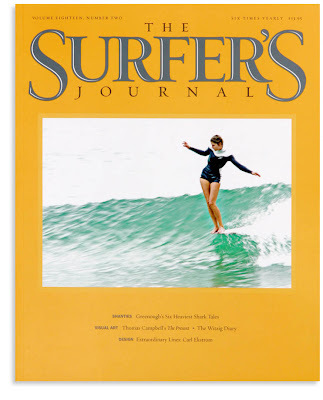 The cover of the latest issue of The Surfer's Journal. Click for the larger version. Galley Friend C.W. sends a link to this Megan McArdle post--she seems to be having maybe-sorta second thoughts about Obama! Who knew! But that's not the point. The real gold is in these two comments down below, where some cranky conservatives are venting about past and future Chrysler bailouts. Meet the new Amtrak, same as the old Amtrak. Yancey, that's completely ridiculous. Chrysler is NOT the new Amtrak. The new Amtrak is building a "high-speed" rail network that everyone will be forced to ride because the Chrysler they got in lieu of a tax refund is in the shop drawing on our new universal coverage car-care plan ("Car care is a human right!"). The waiting lists for oil filters are going to be awful, don't you know, and you won't be able to get "life-extending" care after 50,000 miles. Steve Sailer has what may be his most devastating deconstruction of a Malcolm Gladwell article yet. The subject is sports and underdogs, and in particular the full-court press in basketball. Gladwell's hypothesis--that weaker teams should press stronger teams to even the odds--is so divorced from basketball reality that I wonder if he's ever played organized ball at any level. Just one season of 8th grade ball would have taught him that the press (like the fast-break) is a way stronger teams (and by strong I mean "more athletic and better skilled and coached") maximize their advantage over weaker teams. My middle-school team was pretty insane in 7th and 8th grades. We had probably 10 guys who could dunk and we went undefeated over those two seasons. (My family moved and I wound up at a different high school, but my teammates would go on to win states in our senior season.) We started every game out in a press, either a 2-2-1 or a 1-2-2, depending on whether or not they showed an ability to pass over the top. Typically, we'd call it before half-time since we'd be up by 20. On the rare occasions other teams tried to press us, they'd give up after a couple possessions. On an semi-related note, we would mostly alternate between running man and a 1-3-1 zone in the half-court on defense. (Our coach was pretty nuts about throwing different defensive looks at people, which had the effect of doing a great job teaching us about the spacial-relations of the game.) The 1-3-1 has the practical effect of acting like a half-court press, with the ball getting trapped every time it goes near a corner. And it has the same overdrive advantage of a true full-court press--it maximizes the better teams advantage. Also, it was amazingly fun to play. The reason it's not taught more often, however, is because it's only effective when used by very good teams. Saw the new Star Trek last night and have some assorted thoughts. I'll try to keep this spoiler-free, so it'll be necessarily oblique at times. If you're just looking for a quick take-away, overall there's a lot to like and admire about the movie, but it isn't an instant classic. * Time travel makes me nervous as a conceit because it tends to open up a narrative Pandora's Box. The Abrams Star Trek (written by Roberto Orci and Alex Kurtzman) revolves around a single instance of time travel, which is the engine for the entire plot. And the writing here is exceptionally elegant. Again, without getting into any details, the conceit allows Abrams to create his own Star Trek universe without disavowing or re-imagining the original. It allows the new Trek to have both continuity and freedom to go in whatever new directions it wants. I can't overstate my admiration for this thoughtfulness. But to make it even more impressive, the writers do it with such little fanfare that I suspect most audiences (and critics) won't even realize what's been done until long after they've left the theater. * The casting is great. Ever single performer succeeds in creating interesting characters from the icons. They're helped enormously by the writing, of course, but even so, the featured players do really solid, organic work. Even in this group, though, were some standouts. Chris Pine looks, to my eyes, like a serious, bona fide movie star. He's charismatic and interesting; the camera loves him. I haven's seen a star turn like this since George Clooney took over ER. He's already a far superior Kirk. Zoe Saldana turns Uhura from a background token into an actual human being. It's fantastic, subtle, and even touching work. And Bruce Greenwood makes Christopher Pike into a presence that anchors the film even when he's not onscreen. But then, Greenwood is one of those actors who adds value every time he shows up. * The film really moves. The pacing is brisk and unrelenting. There are very few wasted beats. Nearly every aside has pay-off integral to the story. As a for instance, when Capt. Pike is first taking the Enterprise out he tells Sulu to engage the warp drive. Sulu flubs it and the episode become a joke--a funny little character moment. But it also provides two important narrative points--(1) the minute the Enterprise loses waiting for Sulu to figure things out turns out to be critical and (2) it gives Sulu motivation for another action he takes which might otherwise be out of character. Again, the writers deserve a great deal of credit for this. * The villain, Eric Bana's Nero, isn't quite heavy enough (or interesting enough) to hold his own. The best villains are the ones who act as though the story is really about them. Nero is really never more than an afterthought, a guy keeping us from spending time with the really interesting people: Kirk, Spock, etc. * At times the production felt a little TV-ish. The CGI space battles were less convincing that what was concocted for Battlestar Galactica and some of the sets felt a lot like sets. I don't know what the budget for the production was, but if it cost more than $80M, then I don't know that they got every last dollar up on the screen. * There were, to my mind, maybe three in-jokes too many. Part of the appeal of this project is that it's a chance to bring in new, non-Trek fans and convert them. I think the movie still has a very good chance of doing that, but newcomers will be aware that there are moments passing over their heads. Watching flicks like Trek's Search for Whale Songs or whatever that dreadful movie was, I never would have imagined that there could come a time when the Star Wars universe would become such a joke that nobody could thoughtfully embrace it and Trek would be the only serious sci-fi game in town.